As you will see, this is defiance kicking in and it didn't take very long, did it? We're not even two weeks into our program and I have to have my little transgressions. Well, not so little a transgression this time, I guess. 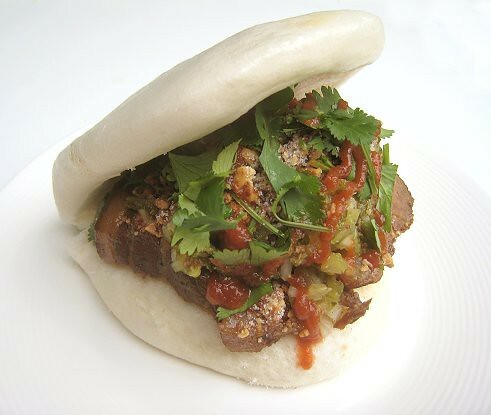 What is Taiwanese Gua Bao (刮包)? For the uninitiated, it's a most spectacular piece of deliciousness. It's also called "Taiwanese Hamburger", which is just so wrong in terms of names. I mean, why do they have ownership of this magnificent beauty? 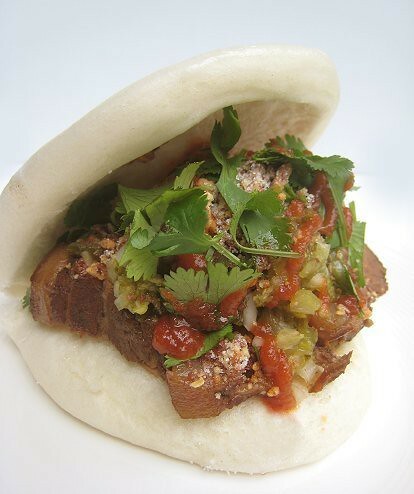 JS recalls gua bao on every street corner in Ongpin during our childhood in Manila. Also, why "hamburger"?! 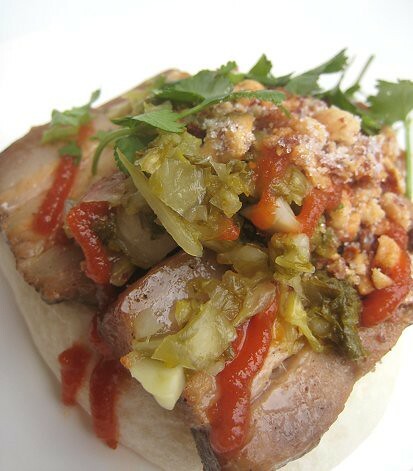 What you have here is a fluffy, soft white Chinese bun, braised pork belly fragrant with what we like to call "the taste of Formosa", tangy-sweet pickled mustard greens, ground roasted peanuts with white sugar, and cilantro. That's right, in our homemade version of Taiwanese Gua Bao, what we have are all wicked things that those nutrition plans tell me I shouldn't have: fatty pork belly, white sugar, and the most refined and bleached flour that you can get to make the bun. It wasn't in the cards for us to make our own buns this time. 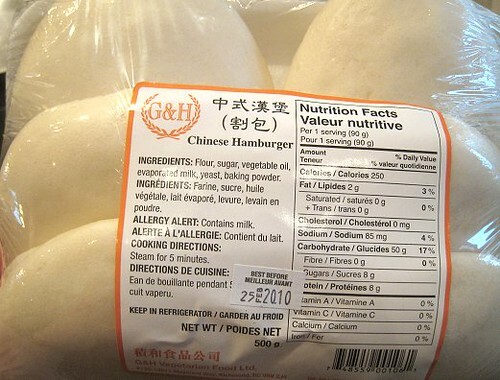 -- besides I don't know how they make these soft, soft, soft, white, white, white buns -- so I headed to the supermarket to buy what they have taken to calling "Chinese Hamburger." It's a mystery, these buns. The one time that I did try to make white Chinese buns, they came out looking a tad grey. In our household, it seems that JS has mastered conjuring up "the taste of Formosa." I started with a couple of pounds of pork belly, which I braised in a soy-sauce-based liquid flavored with five-spice, cinnamon, sugar, garlic, ginger, dried orange peel, Szechuan peppercorns and cloves. The flavors are quite similar to making Taiwanese Stewed Minced Pork (魯肉; 肉燥). After an hour and a half, when the pork is tender but not yet falling apart, I turned off the heat. We let the pork bellies cool overnight in the braising liquid. See them up there, encased in their own fat? I sliced them up while still cold. The pork belly will be heated before assembling the buns. 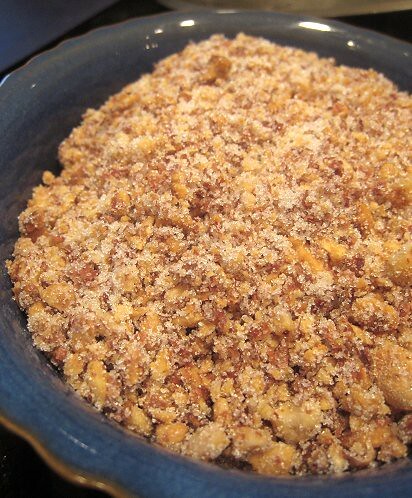 I toasted some peanuts in a skillet and TS proceeded to ground them in the food processor. After which, sugar was added to the ground peanuts. Peanut Sugar is sooooo good! 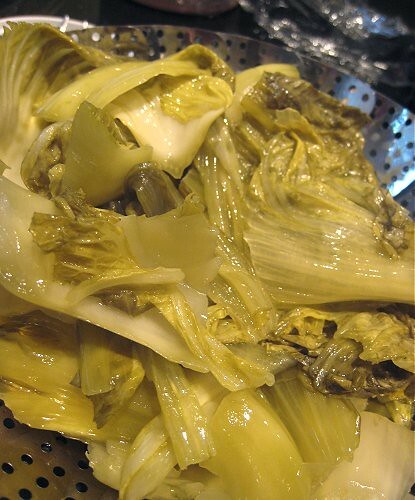 TS also started chopping the pickled mustard greens we have in the fridge. This is an essential ingredient in a gua bao (刮包). Essential, not to be missed. My personal feeling is if there are no pickled mustard greens, might as well dispense with the gua bao. The resulting greens are tangy-salty-sweet. Perfect. 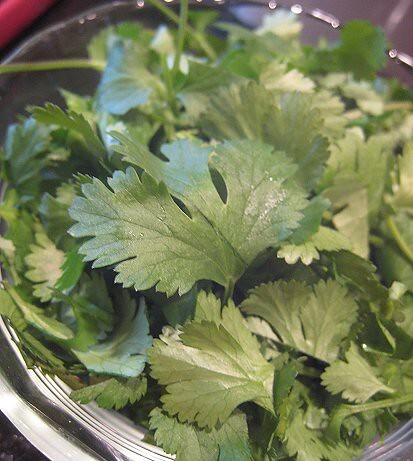 Of course, one mustn't forget the cilantro! Now, it's simply a matter of assembly. 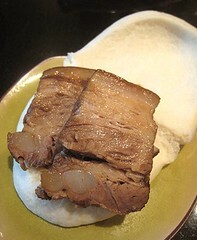 Take your soft, soft, soft, fluffy, white, white, white "Chinese Hamburger" bun, and lay your warmed braised pork belly slices on top. ...then your cilantro. For a little bit of heat (optional), we added some Sriracha sauce on top. Here's a closer look at the interior. 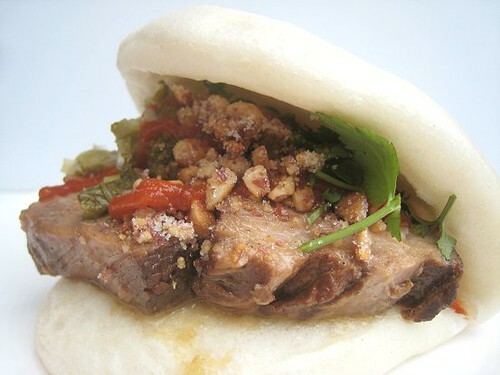 These Gua Baos are a thing of beauty -- I say, what a way to transgress! 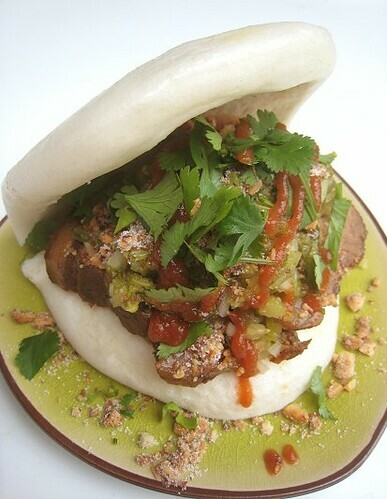 What a symphony of flavours and textures: the savoury-caramel-ly unctuousness of the pork belly, the salty-tartness of the pickled mustard greens, the sweet and nutty peanut sugar, the heady herbaciousness of the fresh cilantro sprigs -- all of that nestled within that soft, soft, white, white bun! I'm drooling right now just remembering it! I remember some of the gua baos of my youth would be served with a few slivers of bird's eye chilis -- and that is also one option here, but for some reason, we didn't slice up some chilis. 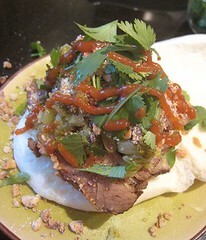 Instead, we ate some of our gua baos with Tabasco sauce and some with Sriracha sauce. 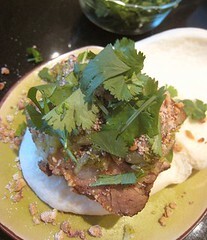 Now, is it any wonder we were failed to be impressed by those Momofuku buns? No comparison. At. All. 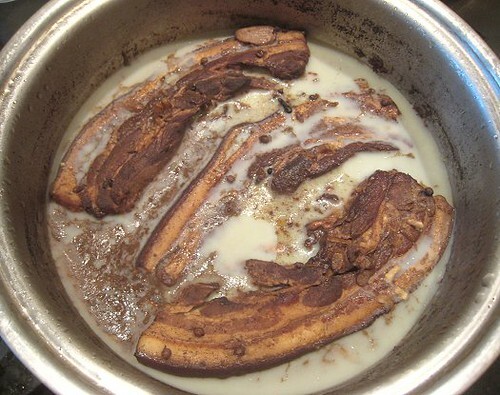 Put pork bellies into a pot and add all braising liquid ingredients. Bring to a boil, then simmer on low heat. Cook for about one-and-a-half hours until tender. If not using right away, let cool in the braising liquid, then store in refrigerator. 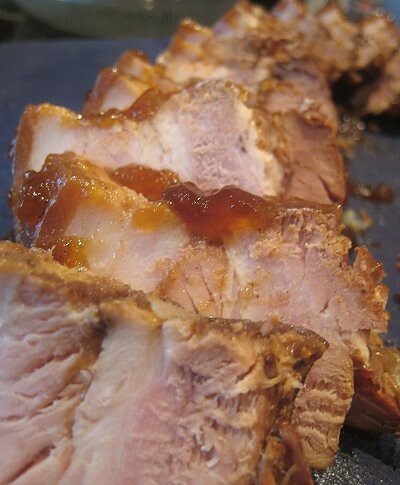 Slice pork bellies into half-inch slices and set aside. We modified this to include sugar. To use for gua bao, drain some greens and chop finely. 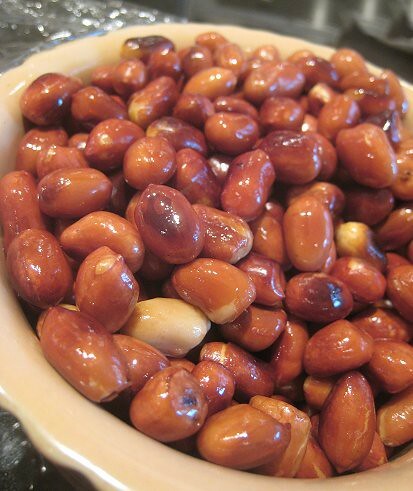 Simply toast/roast some raw red-skinned peanuts. Let cool. Grind in a food processor. Mix in white sugar (to taste). 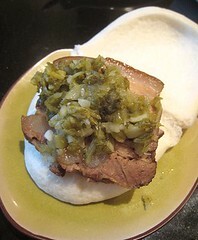 Open up "Chinese Hamburger" bun and lay 2 slices of warmed braised pork belly. Add chopped pickled mustard greens, ground peanuts with sugar, and some cilantro. Add hot peppers or hot sauce, if desired. Enjoy! For showcasing PEANUTS blended with SUGAR for use in a savory dish, we're submitting this post to Weekend Herb Blogging, a world-wide food blogging event (created by Kalyn's Kitchen, now maintained by Haalo of Cook (almost) Anything at Least Once) with the goal of helping each other learn about cooking with herbs and plant ingredients. If you'd like to participate, see who's hosting next week. WHB is hosted this week by Haalo of Cook (almost) Anything at Least Once herself! The Hokkiens call it Kong Ba Pau...and there is just braised meat and Chinese bun! No pickles, nothing else. I'll be honest, I got stuck at the peanut sugar pic. Peanut SUGAR?? Freakin awesome. Oh, wow. That is a thing of beauty. I just ate almost the same thing (they had Taiwanese red sugar for sprinkling though) at Baohaus in New York. A pity it was so small and didn't last very long! Wow TS - You've outdone yourself! My only question, isn't using 5 spice, and then adding cinnamon, orange peel, ginger, and Sichuan Peppercorns kinda redundant, since they are ingredients of 5 spice? I'm pretty sure you've put me in heaven with this recipe. I adore those buns! I'm headed to Chinatown this weekend. No doubt about it. yes like what tigerfish says, we have something similar here called the kong ba pau. I love your home made version with the generous fillings. WOW. how is it that I've never heard of this. I'm on a plane bound for LAX right now, but I'm half tempted to disembark and transfer to a flight Taipei so I can have one of these. I love peanut sugar. Just make some for snacking. Teehee. Thanks! We do love our Taiwanese dishes; at least, the ones we know. That's the way we like 'em! 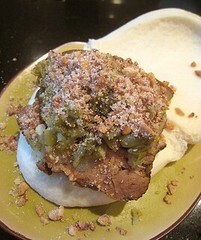 Yes, in our homemade version, we cxan pile on the pickled veg and, especially, the peanut sugar. Oh really? I read that it was "big" in New York... or actually, maybe the article was just about Baohaus. Yum! Yum! 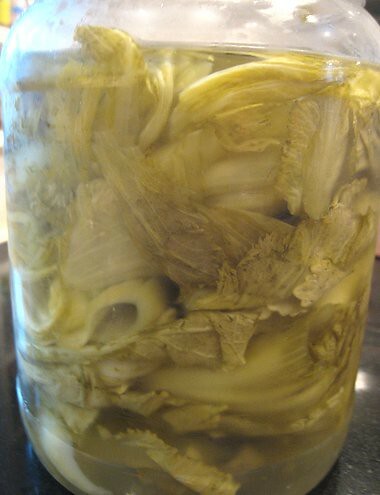 I love pickled mustard greens. Were you referring to these when we talked about how I didn't like bastilla because I can't do meat that's like dessert? The sugar and peanuts sprinkled on top is just enough for contrast, not the same. I'd wolf these down in a heartbeat. Yes, yes, this is what I was talking about. We just came back from Manila and Taipei and had this gua bao in Taipei. I was intent on finding a recipe. Of all that I've seen online, yours is the most like what I had ... Yummylicious! Can't wait to pick up the ingredients to try. I also want to check if I can buy the pickled greens pre-made. Thanks! Woohoo, glad to know this is the most authentic, hehe. I think they *do* sell the pickled greens, it's just that we get confused at all the different ones available (and their non-helpful English labels). 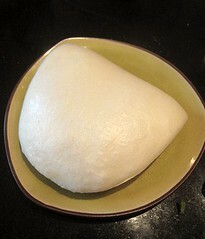 Have fun making gua bao! Awesome recipe - I can't wait to try it. For the pickled greens - how much sugar do you use and when do you add it? I just layer sugar along with the salt and mustard greens. Or, you can also heat up the vinegar and dissolve the sugar in it. Do it according to your preference. Some people like it more salty, others more tangy... I do tend to like the pickled mustard greens all sweet-salty-tangy.